Hello Darlings, Canadian fashionistas rejoice! Together with fashion brand French Connection and social fashion website Chicisimo, WithLoveGabrielle is having an awesome contest for one fashionista to win a $500 shopping spree at French Connection - plus the opportunity to model your new French Connection looks at their fall fashion show in Toronto on October 4th. The contest kicks off on Friday, August 31st and runs through Thursday, September 27th. 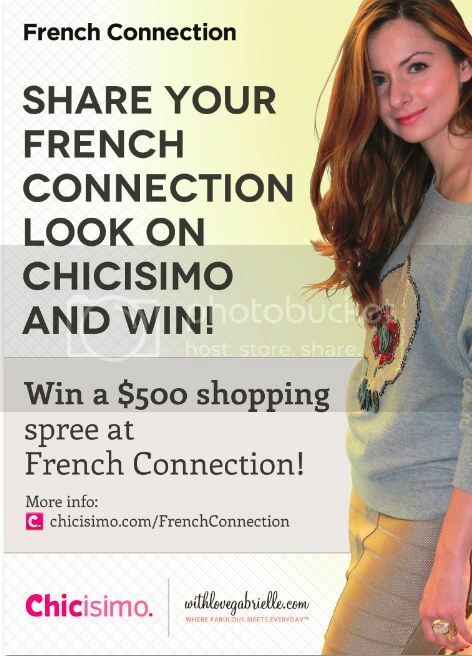 To enter, visit www.Chicisimo.com/FrenchConnection and share photos of yourself wearing looks with pieces from French Connection. If you've never tried, Chicisimo is my favorite website to browse photos of stylish outfits shared by other fashionistas from around the world. It's an amazing place to check out new trends, and get inspiration for new pieces to add to my own wardrobe. On Chicisimo (which translates from Spanish meaning "super chic") everyone can vote on their favorite looks by clicking the "chic" button. If you enter our French Connection fashion show contest, the more "chics" you receive the more prominent your look will appear on Chicisimo - so be sure to ask all your friends to join the site and "chic your look". I will also be awarding Chicisimo "flowers" to feature my favorite looks, to also help raise awareness of my favorite French Connection contest entries! So if you ever wanted to be featured in a fashion show, here's you big chance! The contest is open to everyone in Canada, and note that flights and hotel will be provided if our winner lives outside of Greater Toronto - so get sharing fashionistas of Vancouver, Alberta, Quebec, the Maritimes, and everywhere else!